Big chop in June 2009. 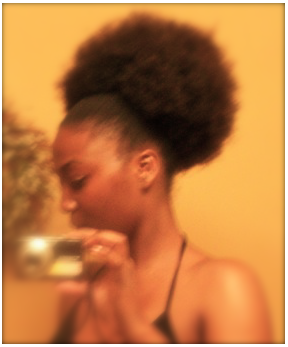 I think the biggest mistake I’ve made has been comparing my growth to other ladies with Chia hair. You know those ladies -- they have SL hair in May and WL hair by August. Yup, I was setting myself up for failure by comparing my growth to theirs. Once I began to think positively about my growth and even visualize myself pulling my hair down to my goal at the end of the year, I started to see more results. My routine varies by the season. But overall I describe it as: 1) Low manipulation, 2) Low cones/sulfates, 3) Ayurveda and 4) PS 95% of the time. In warmer months, I tend to rock mini braids and water rinse or cowash them daily. I seal in the moisture with either grapeseed oil or a cone condish. I cleanse and DC (protein followed by moisture) once per week. In the winter, I cornrow my hair on Saturday, cleanse and DC on Sunday, rock the cornrows under wigs or headwraps M-F and rock big hair for Friday date night :) I tend to water rinse or cowash the cornrows every other day, rub in some condish and seal with EVOO. Every now and then I’ll throw in some extension twists or braids for about 3-4 weeks and then go back to whatever style it is for the season. I primarily finger detangle (about 90%-95% of the time). I keep my coily hair stretched at all times; never allowing it to be wet and loose at the same time (I do everything in braids/cornrows). I M&S daily. I cleanse and condition with Ayurveda mixes. And I rock a men’s satin skull cap under my wigs/headwraps and around the house to keep my strands protected. But really, this year I’ve doubled my water intake and am doing more exercising by way of dancing. It’s all about baby steps right? 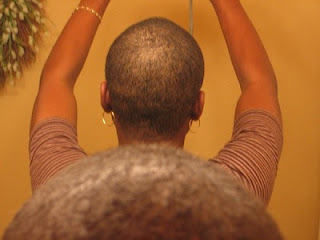 -Find a good cleanser, conditioner and moisturizer. You can add on goodies from there. -Keep your hair clean and moisturized. .
-Baby those ends (keep them tucked away and extra moisturized) and treat your hair like fine silk. -Take pictures every 3-6 months to track your progress. It really helps!